Want to trade your Bushmaster AR-15 for a $100 supermarket gift certificate? Didn’t think so. Weeks after the mass shooting at Sandy Hook Elementary that left 20 children and six teachers dead, the American public is still demanding that lawmakers say how they plan to stop future gun violence. One anti-gun measure that is picking up steam is community gun buyback programs, where people can turn weapons into the police for a couple hundred bucks or shopping discounts. These events have already been going on for years, but in the last week alone, at least six cities have scheduled new buybacks. Proponents say that they get guns off the streets and slash local crime rates. But critics point out that coaxing people into selling their weapons for cheaper groceries won’t do much to stop mass shootings. 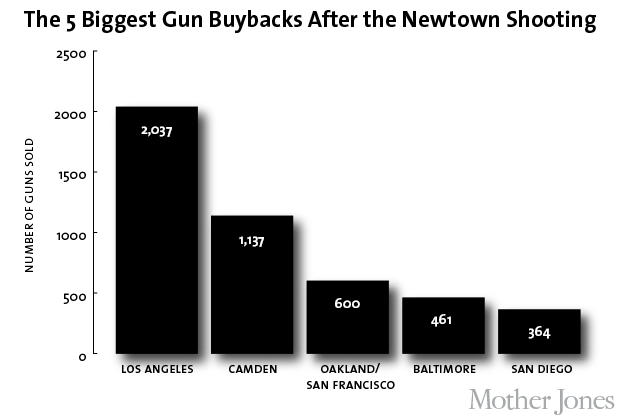 Since Newtown, there have been at least 27 buybacks held or planned. The shooting appears to have had an impact on cities’ decisions to hold gun buyback events as well as people’s decision to turn up. The largest buyback, which took place in Los Angeles, was scheduled for an earlier date because of the shooting; it ended up netting over 2,000 firearms. 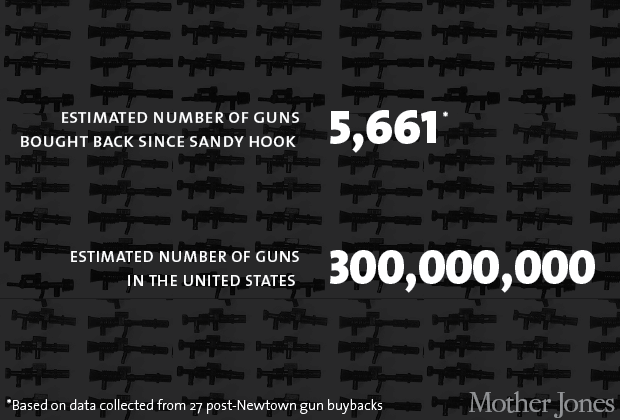 A buyback in New Albany, Indiana, held two weeks after Newtown, was so popular that $50,000 in buyback funds were spent in 90 minutes. 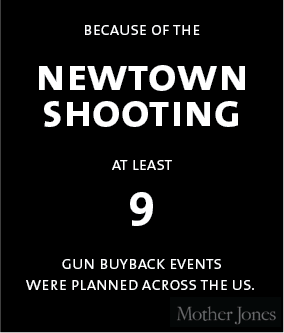 New buyback events were scheduled in Ithaca, New York, Pueblo, Colorado, Santa Fe, New Mexico, and Piedmont, California, because of Newtown. And places that scheduled gun buybacks before the mass shooting, like Oakland, San Francisco, and Camden, New Jersey, saw record numbers of guns turned in. Gun buyback programs have even drawn the attention of federal lawmakers. 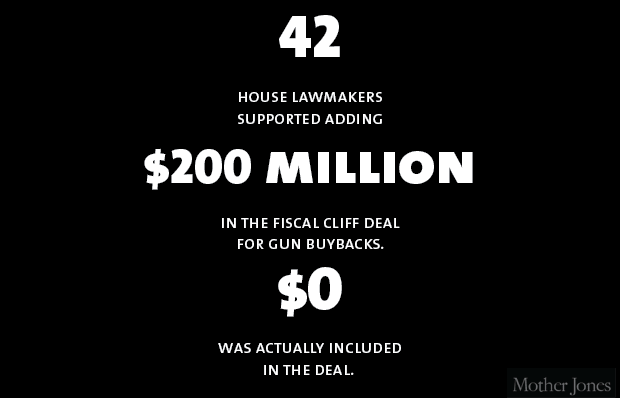 Rep. Gerry Connolly (D-Va.) cowrote a letter with Rep. Ted Deutch (D-Fla.) on December 21 requesting that $200 million in federal funds be set aside for gun buyback programs in the fiscal cliff deal. George Burke, a spokesman for Connolly’s office, told Mother Jones that increasing funding could go a long way towards encouraging communities to start new buyback programs. 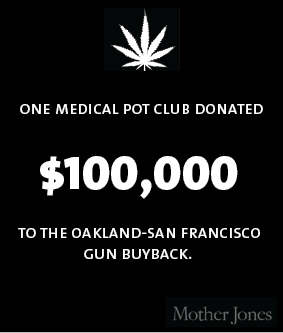 Buybacks, which can cost in the tens of thousands of dollars, are usually funded by eclectic sources, ranging from supermarkets to state criminal forfeiture funds to, in one case, a medical marijuana group. City officials remain enthusiastic that these events work. The Los Angeles Police Department claims violent crime has decreased 33 percent since the city’s buyback program began in 2009. Lester Davis, a spokesman for the Baltimore City Council, says that buybacks “take dangerous weapons off the street” and pointed to a buyback on December 15 as an example. “We received more than a dozen firearms that violated federal statues,” he says. Jon Vernick, codirector of the Johns Hopkins Center for Gun Policy and Research, told the Daily Beast that gun buybacks are a political cop-out. While buybacks give communities “a visible thing to do” after mass shootings occur, he said that “conducting buybacks is much easier than fighting the political battle.” And as illustrated in this chart, Congress can’t even get that accomplished. Although Connolly’s letter had the support of more than 40 House members, it ultimately wasn’t included in the deal, as “many Republicans were not conducive to the provision,” according to Burke. While a national gun buyback program isn’t on the table for now, if you want to see what one might look like, head down under. Australia, which saw several mass shootings in both the ’80s and ’90s, successfully bought back and destroyed 650,000 guns after an especially violent shooting in Tasmania in 1996, effectively ending mass shootings in the country. There was one tiny difference: The buyback was mandatory. More Guns, Fewer Deaths? Not So Fast.